Occasionally the Greater Saint Louis pool community plays host to a billiards celebrity--or even a team of them. On this page you can find information on upcoming exhibition matches or other tour-related entertainment. Friday March 10th at THE CUE! Watch Justin Bergman and Justin Hall race to 11. Followed by a couple challenge matches then a race to 3 banks! Starts at 7pm ! Excited to announce the Team USA Sharpshooters tournament that will also take place at BallPark Village November 30th! We have 8 fantastic teams of five players! The teams will play Mosconi Cup style matches. The winning team will get season tickets to the 2017 Mosconi Cup in Vegas! VIP treatment, specialized Team USA Sharpshooters jerseys with individual names PLUS a travel expense for Vegas! The competition will be fierce. Don't miss the chance to see the best in the world today, playing the All time Greats! Plus now your friends competing to be a Team USA Sharpshooter! Watch the video here for more information about all the events happening during the day. This is a 2-day event. Exhibition matches on Thursday, private clinic on FridayExhibition matches: Archer vs Quinn | Appleton vs BergmanPrivate clinic is $200 per player and limited to 12 participants.EXHIBITION SEATS ARE NOW ON SALE. Go to http://www.teachersbilliards.com/OLDSITE/SeatingChart.pdf to see the Seating Chart. Make your selection. Message me your choice. PayPal me at teacherman@teachersbilliards.com or call with Cr Cd. $30 VIP. $10 General Admission. VIP gets you entry into Raffle and chance to play Scotch Doubles with Johnny Archer and Darren Appleton. An exhibition match between Roberto Gomez, Dennis Orcullo, and Justin Bergman will begin at 7pm. First up, Dennis plays Roberto, the winner then plays Justin. After that match, all three professional players will be available for challenge matches. Come out and meet Cary and Finnegan from the TruTV show The Hustlers. These are both well known New York City pool players and action men. They will be in town for one day only. Contact One More Shot for tickets. Limited availability. Justin Bergman and Sky Woodward vs Dennis Orcullo and Roberto Gomez. Teachers Billiards Presents: Young Guns vs Old School. Justin Bergman and Skylar Woodward vs Johnny Archer and Rodney Morris in an All-Around Mosconi Cup format 2-day event! Friday and Saturday June 19th and 20th, 2015. Live PPV available or in-person seating with limited availability.8-ball, 9-ball, and 10-ball in both singles and scotch doubles formats. Total of 15 matches possible, team that wins 8 points secures victory of grand prize: $20,000!! 9-Ball, Race to 15 on the 9-foot Diamond. Live streamed by Teachers Billiards. There's been a lot of rumble in the female pool world locally and after some negotiation and plenty of offline messages, this is the result. Come on out to watch what's sure to be a great match in person, or check out the stream here. 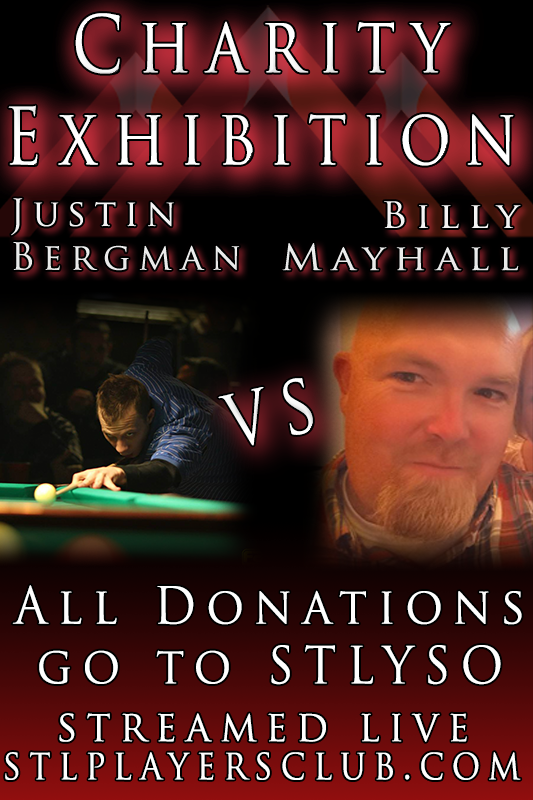 Justin "Iceberg" Bergman will play Oscar "The Big O" Dominguez alternating races of 10-ball (to 21) and 8-ball (to 13) at ABC Billiards in O'Fallon, Missouri April 7th. It's possible this match will continue on the 8th, as decided by the players.This will be a Rack Your Own event, using the Magik Rack. PPV live streaming provided by The Player's Club and PoolActionTV.comThe PPV is $10/day. You can purchase the PPV at this link.The chat room for this event will be held at TPC's UStream page, found here. Just pop-out the chat window and put it next to the video window to keep an eye on both!More details to be published as soon as they are available. Keep checking back! The Lindenwood Lions will face off with the billiards team from Quincy at 1pm. This match is open to the public. The event will be held in the Field House on Lindenwood's campus. The Legends and Champions Tour was built to give more of today's young players to the opportunity to meet and play with some of the game's greastest. This tour features Johnny Archer and Nick Varner. If you know of an exhibition event not listed here, please let us know.